Why are more and more large and mid-sized organizations now considering data center outsourcing? Do the pros of IT outsourcing outweigh the cons? Or do organizations want to embrace the trend for the financial and operational advantage that outsourcing data center management offers? Unfortunately, a simple yes or no won't suffice to answer the above questions. As per a recent survey of Fortune 500 companies by Forbes, most IT companies now prefer IT outsourcing, over in-house data center operations, the reason being the advantages that data center outsourcing has to offer. This includes minimized operational costs, better use of infrastructure, access to servers and computing/storage on demand, etc. Before you decide to outsource your data center, carefully examine your options, analyze your business perspectives and conduct a careful examination of your assets, budgets and requirements. A careful evaluation of the pros and cons of data center outsourcing and how it can impact your business is something that you must consider before you sign an outsourcing contract. The assurance of data security is something that you must check with the service provider before signing a contract. Without the right amount of data security, you critical data might be at risk to malware infections, or worse still, corporate theft! As a part of data center outsourcing, you can outsource anything and everything from managed hosting, database administration, and application performance monitoring to managed storage and systems management service providers. 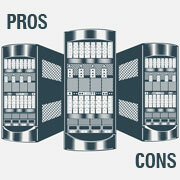 You can also choose to outsource your data center on a multi-year or annual basis. In fact, you could get the service provider to manage your infrastructure on your premises or even get the vendor to provide you with a leased data center in an area owned by the vendor. In hindsight, outsourcing data center operations is a great way to align your IT requirements with your business objectives cost-effectively. Top benefits include better financial and operational efficiency, proactive monitoring, higher customer satisfaction, and professional management of IT infrastructure. However, critics of data center outsourcing argue that no external vendor will be able to match the service levels offered by an in-house team. Therefore, you need to carefully weigh the pros and cons of outsourcing IT services before deciding on a suitable offshoring partner. At Outsource2india, we have been offering global companies with cutting-edge data center services for over the last 20 years. From reliable remote monitoring services to digital forensics and IT Helpdesk services, we are a one-stop destination for any infrastructure management solution that your enterprise might require. Our lightning fast turnaround time (3 to 6 hours), unmatched level of accuracy, service customization, transparency, affordable costs, and ability to work with multiple file formats have made us the first choice when it comes to data entry services. Get in touch with us today and we promise to help you make the most of your data at an affordable cost.